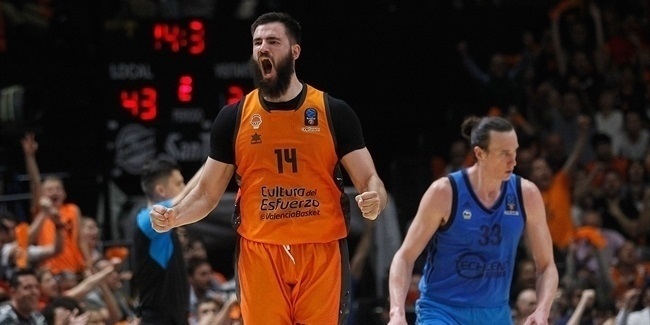 An exciting Friday night in the 7DAYS EuroCup Quarterfinals saw three teams bounce back from Game 1 defeats to even their series while only Valencia Basket qualified to the semifinals with a sweep. Three players – Dylan Ennis of MoraBanc Andorra, Rokas Giedraitis of ALBA Berlin, and Dmitry Kulagin of Lokomotiv Kuban Krasnodar – paced their teams to do-or-die victories by posting performance index ratings of 23 each to share the Game 2 MVP honor. Giedraitis led ALBA to an 81-101 road win against Unicaja Malaga with 23 points on 4-for-4 two-point and 5-for-7 three-point shooting. Kulagin scored 26 points by making 6 of 11 two-pointers, 3 of 4 three-pointers and 5 of 6 free throws in his team's 68-59 home win against UNICS Kazan. And Ennis led Andorra to a 98-79 home win against LDLC ASVEL Villeurbanne, finishing the game with 15 points 6 rebounds, 3 assists and 3 steals. His teammate Rafa Luz and Mike Tobey of Valencia, each with a PIR of 22, complete the top individual performances in Quarterfinals Game 2. Kulagin led all scorers in Game 2 with 26 points. 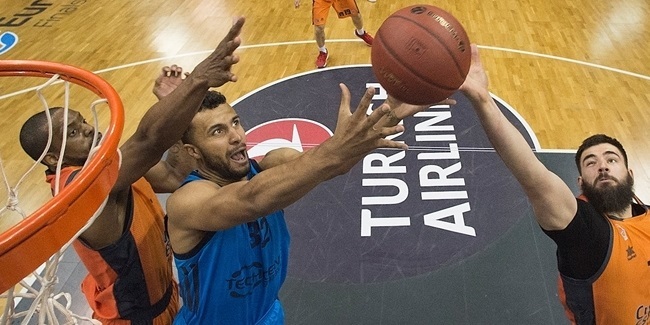 Diante Garrett of Tofas Bursa remains the EuroCup's season-long scoring leader with 18.4 points per game. ASVEL center Miro Bilan led all the rebounders with 8 boards in Friday's games. Jalen Reynolds of Zenit St. Petersburg heads the rebounding charts this season with 8.1 per contest. Unicaja's Brian Roberts and ALBA's Martin Hermannsson each had 9 assists, the most in Game 2. Garrett is this season's assists leader with 6.1 on average. MoraBanc's Ennis and D.J. Seeley of Rytas Vilnius had 3 steals apiece, leading all the players in the second game of the quarterfinals. Javonte Green of ratiopharm Ulm is EuroCup's overall steals leader with 2.5 per game. Three players had 2 blocks in Game 2: Matthias Lessort of Unicaja, Maurice Ndour of UNICS and Landry Nnoko of ALBA. Robert Upshaw of Arka Gdynia remains the season leader with 1.7 blocks per game.